Hanover, Ontario natives The Mercey Brothers grew up with music and they started to seriously pursue a professional career together starting in 1957 as the duo of Larry & Ray Mercey. With a signing to Chateau Records, the Merceys made their first chart appearance with "Just The Snap Of Your Fingers" in 1961. Brother Lloyd joined the fold in 1966 and they struck a deal with CTL/Columbia that same year releasing 4 RPM chart topping singles in a row starting with 1966's "Whistle On The River". 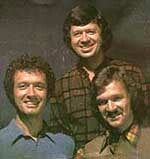 In 1970 they signed to RCA and another string of singles. They won Best Country Artist Junos for four years straight (1969-72). Their 1971 hit singles "Hello Mom" and "Who Wrote The Words" led to a tour of England and an appearance on BBC television. By 1973 they had opened their own recording studio in order to capitalize on their prolific output in less time. By 1975 they'd also started their own imprint label called MBS Records giving them more control over their product. The label would also act as a home for other fledgling acts like Terry Carisse and Joan Kennedy amongst others. By 1980 the band decided to shut down their recording facility and by years end, brother Ray had left the band to first act as manager (freeing him up to spend time with his family) and then finally resigning himself to carpentry work. To augment the band in Ray's absence the Merceys brought in some young blood in 1981 with George Ogilvie and Darrell Scott. They were replaced in 1983 to 1985 by Dann Peer and Gord Heins, followed by John Dymond and Eric Mahar in 1986. By 1989, after 32 years in the music business, The Mercey Brothers called it quits. 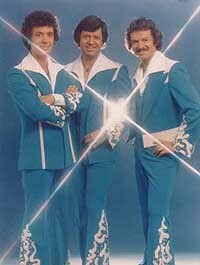 Ironically, they were inducted into the Canadian Country Music Hall Of Fame the same year. Lloyd put together a pick-up rock band while Larry pursued a prolific solo career. July 1st, 2014 The Mercey Brothers were inducted into the Labyrinth of Distinction in their hometown of Hanover, Ontario. On June 26th, 2016 The Mercey Brothers were inducted into the Bruce Grey Music Hall of Fame. To order by cheque or money order use the "order form" on this website.